I use the same make of rod but in different lengths. I own a Shimotsuke Kiyotaki in 7’, 10’, 11’, 12’ and 13’ lengths. I find that this rod which I believe is regarded as a Keiryu rod suits all my fixed line fly fishing requirements, regardless of the size of fish I catch, which tend to be small coarse fish (bleak, dace, roach perch) here in the UK. All the rods collapse down to 15”. I can easily carry a couple of rods in my bag on public transport as I no longer have a car. There is also a bonus as my wife has no idea I have a couple of rods in my bag when I go out, so I can ‘sneak’ the odd half hour or so on the canal! I’ve not stuck with one rod this season, but pretty much one length, 4m. I have used a Keiryu rod, the same model in three lengths, each rod serving as parts for the other. I fish a variety of streams, open and windy to tight and frustrating. Some streams that I fish, one length rod will not do if one wants to fish the whole stream. I want one rod that is excellent that I can nearly do all the streams I fish. I think I’ve got the rod. So now I’ll do it and see how I feel after a season of it. I am not going to fish it in Marble Canyon, I’ve got other rods for that and it’s not tenkara so to speak but more like simple fly fishing without a reel. There is utility in choosing just one. Like one fly, you learn things you can’t with choices. I enjoy learning, I like keeping an open mind to new things, operating with knowns but realizing that advances are often made searching and practices outside of what we know. So, I am tying up my box of kebari now. Just a few tweaks on pattern choices. Not much change there. Lines, got that, need to stay with my +1.5m and same length short. Mostly refining but looking at the way my kit is put together and trying to maximize the components to work together to make the sum greater than its parts. Nice that you noticed that David. I’m new here but love this idea, 90% of the time I fish a 4 m rod. The 2 I use the most is Oni 1 and Tanuki xl1 if I had to pick it would be the Oni. Welcome to 10CT forum, I’m pleased to read new observations from new members. I too mostly fish with 4 m rods, which also is an indication I mostly fish were 4m rods are usable and the appropriate choice. It’s kind of an irony that the “one fly” philosophy is written about more often than “one rod” philosophy. There are of course many interesting rod models, each having their own unique character. But additional flies are lower cost to make or buy and test out a variety of patterns. 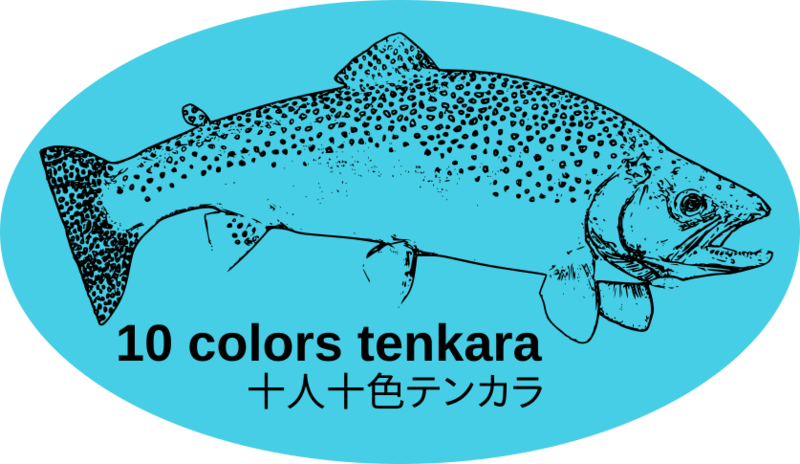 Oni 1, Suntech Tenkarabum 40, Discover Tenkara Karasu 400, Tenkara Times Watershed 400. Which at the moment I would probably rank them in that order. But tomorrow, maybe a little shifting of the order. As some of them I’d have to rank by coin toss they are that close, and how I’d rank them dependent on fishing conditions that day or my mood that day as to which one I’d prefer to cast. because each one has a little different character. I’ve been looking very seriously at the Tenbum 40, I’ve also have a gamakatsu 390 that is quickly becoming a go to rod. I like the Tenkarabum 40 a lot, too. Nice casting rod. The smaller diameter grip takes a little getting used to, but I’m okay with it. I guess it cuts down the total weight a little. Very nice balance rod, feels light in the hand. Close to the Oni 1. Not demonstrating much of a case that I’m pursuing one rod. However, last summer I probably fished 70% of the time with the TB40, another 25% of time equally divided between the Oni 1 and Karasu. Not due really to a great preference for one rod over another. More convenience, why dig out another rod, when the one used on previous outing was already out of rod sock and tube, rigged and ready to go. The remaining time fishing with 3.6m or shorter rods, when seeking smaller streams where the water level fell sooner than on larger streams. It rained here so much last summer I really didn’t get to fish very often, time fishing was the lowest of the past six years, and caught something even less often. Looking forward to rain frequency being back to average this year. Writing about a preference for 4m tenkara rods, and the Oni 1 4m rod in particular. I wonder what the 4m Nabeya TSURI-PAL[ （なべや）- Tsuri pal] tenkara rods are like? Searching the internet I have ocassionally seen Tsuri-Pal rods, but never paid them much attention to them nor pursued learning more about them. Looking around their website some more, they also write about another genryu 3m, tenkara rod, that is not listed on the above webpage. Perhaps it is listed under a different category of rods. I will put the link to the website post about the 3m rod at the bottom. I only know about the connection between Nabeya rods and the Oni rods, because earlier this evening I was reading the Discover Tenkara 2016 blog post reviewing tenkara rods and their characteristic. “Tenkara Rod Reviews: Top 10 Insider Tests for Rod Performance”. No doubt I have read that blog post before, and their subtopic about the “Mysterious Mr. Abe” did not grab my attention at the time. Good, but long article, with a lot of information. I would agree that while rod moment and center of gravity will tell you a lot about a rod. There are other rod characteristics that also create the personality of a rod’s quality. Rod flex, tip dampening speed, the rod’s tuning for casting different types of lines, or to match different preferred casting style, etc. All factors that lead me to like the before mentioned 4 rods, each 4m in length, but each also a little different feel to them, making it difficult to rank them from clear favorite to less favored, or just decide it is not necessary, a photo-finish in a race. Each one liked practically equally for different reasons. Maybe Nabeya Tsuri-pal rods should be more known about here. otoh, I don’t know if the first Oni rods are of the same quality as the new ones or if Nabeya also makes the newer versions. I couldn’t find any links to Tom Davis reviewing any Tsuri-pal rods on his blog. And Dr. Tom seems to have a knack or gift for obtaining and testing just about every brand of tenkara rod, that isn’t clearly a low quality rod, not worthy of his time to review them. It’s amazing how much those look like Oni rods. I too read that article some time back, but the information takes on a new light after reading your post. Thanks for sharing. I sent them an e-mail and will update this thread when and if I hear back. Hopefully my google translate wasn’t too bad. Welcome to the forum @sparrow. Thanks for joining us, great to have you here. Thanks Peder, it’s great to be here! It will be interesting to read their reply. Except for finding post about the Nabeya tenkara rods on their own website, occasionally finding one of their rods listed in an online shop, or finding pictures of their tenkara rods (both the 3m and 4m rods) on imaging websites. I am not finding much on line about them. However, not everything is posted about online. Here is a link to a 2009 blog post about replacing the EVA grip with a cork grip on a 3.9m Tsuri-pal rod. わざわざこんなことしなくても It is not necessary to bother doing such a thing. ここをクリック ⇒ Click here, the arrow pointing to - Demon Master’s Rod (the old TenkaranoOni blog post about when the original Oni rods were being developed and offered for sale. From a few of the Nabeya blog post their tenkara rods are capable of landing big fish. Though maybe or maybe not just a big fish rod. 早速大物を釣り上げました。caught a big game at once. Two animals, 48 cm ito, 45 cm iwana, 37 cm yamame. It does not break even if a such a big game taken with tenkara pole! ! でも、テンカラ竿です。But it is a tenkara pole. Mr. Kinoshita fished a large Yamame in the Sagami River water system. It would be more reassuring if more independent testimonials about their tenkara rods could be found. From someone other than the Nabeya group themselves. Tyson, you never know. You might hear back from them and be surprised someone in the shop is fluent in English. Ah, she who must be obeyed and kept happy has summoned me from afar, informing me I need to stop being a layabout and cook dinner. David, I had at one point thought about obtaining and reviewing the Nabeya tenkara rod, but I have a first generation Oni type I and was told by Oni that it is essentially the same blank, just with Oni’s personally made handle on it. Therefore I haven’t decided to pursue that acquisition. I have not yet heard back, hopefully my translation was correct. I could only imagine what it possibly could have ended up. God knows how “rod” translates for sure. Tom, thanks for that information. It sounds like TenkaranoOni, worked with Nabeya to develop the first generation 4.0 m Oni, that Nabeya now continues to sell as the 4m tenkara Tsuri-pal rod. And I think most people who have fished with both the first generation and later generation Oni rods - view the later generation Oni rods as being superior to the first generation rods. The Nabeya 3m tenkara rods otoh, might be something unique, and appealing to people that like short rods that are compact when collapsed. It was introduced eleven months ago. At the top of their topics list dated April 20, 2018. Not a low cost rod at 40,000 JPY, about $360. Rod is the easiest word. In kanji 竿. In hiragana さお, or katakana サオ. After that it becomes a little more difficult because Japanese sentence structure it kind of backwards, inside out and reversed from English sentence structure. Mostly the verb goes at the end. Best to use simple sentences. テンカラロッド購入方？ tenkara rod how-to buy? Perfect thanks, I was half joking about rod translating, I have seen a few very peculiar translations, at least from Japanese to English of other words of course. And I think most people who have fished with both the first generation and later generation Oni rods - view the later generation Oni rods as being superior to the first generation rods. I’m not sure about that. Most of the folks that I have talked to feel the other way around, that the original Oni type I was better overall. But it sure was heavier than the current generation. Maybe that is where your statement comes from. Still, it’s probably up to perception. Both the original Oni and the current are great rods. It’s splitting hairs. I stand corrected from my incorrect recollection. Both the original and later models are fine rods, just a little different. Which makes the Nabeya Tsuri-pal 4m tenkara rod a little more interesting in how it may have been refined over the last five or 6 years. Comparing the 2013 tetontenkara review of the Oni rod to the specifications of the 4m Nabeya Tsuri-pal tenkara rod there are only very slight differences. Perhaps only due to how the measurements were made. Or maybe due to some small evolution updates in how the Nabeya rods are manufactured now. Specifically rod weight 101.1g vs 95g, and collapsed length 63cm vs 61cm. Those differences may have more to do with whether the tip plug was included or not included when the measurements were made. However, I am assuming the Oni rod reviewed in 2013 was a Nabeya made rod, which may be incorrect. It might be a rod made by who ever makes the the current Oni rods. It appears the handle is less refined, possibly leading to a few extra grams.